When it comes to household names of Japanese tourist destinations, Sapporo, Osaka, Fukuoka and Tokyo may come to mind for the average Korean. 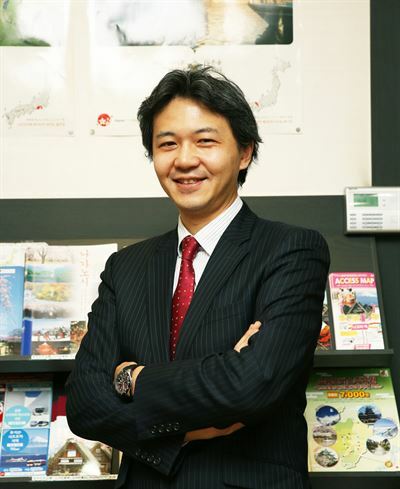 However, Takanari Yamada, executive director of the Japan National Tourism Organization's (JNTO) Seoul office, says they are only a fraction of the sightseeing spots in his country that he believes is full of attractive yet unknown destinations that are sure to entice Korean travelers. "Most Koreans tend to travel to only well-known places such as Osaka, Sapporo, Kyushu and Tokyo. For people who have already visited Japan many times, I would recommend eastern Hokkaido," the 48-year-old said in an interview with The Korea Times. Hokkaido, the northernmost of Japan's main islands, is already one of the most popular travel destinations for Koreans thanks to its capital, Sapporo. However, he regretted that Koreans traveling to Hokkaido fail to fully enjoy the charms of the island as their itineraries are all about Sapporo. "They only go to southern Hokkaido, including Sapporo, but I would recommend another side of Hokkaido in the east, full of natural attractions such as lakes, mountains and wildlife," Yamada said. "People will be able to feel the enormity of nature if you go there, which is absent in Korea." A lack of flight infrastructure is also discouraging Koreans from going east as the Sapporo airport is the lone gateway for Koreans. For this reason, representatives from local governments there often visit Korea for promotions and appeal their marketability to Korea's airlines. "Along with eastern Hokkaido, we still have a bunch of new destinations as attractive as Sapporo and Osaka. So, I hope Korean tourists will experience Japan's new charms that they have never experienced," Yamada said. Despite soured ties between the two nations, Japan is the darling of Korean tourists as the number of Koreans traveling to the neighboring country last year reached a record high of 7.54 million, an increase of 5.6 percent from a year ago. The two sides have also been at loggerheads due to a military spat involving Japanese military aircraft flybys at menacingly low-altitudes close to Korean warships in December and diplomatic tension over a Korean court rulings last year against Japanese firms over wartime forced labor. "I really appreciate that such a large number of Koreans visited Japan last year despite the diplomatic feud," Yamada said. The Japanese director ascribed the milestone achievement to his country's tour content that can suit all the needs of "particular" Korean travelers. "For example, some Koreans travel to Japan to enjoy delicious coffee and others come to live for a month. Their numbers are not that great, but we still can keep them entertained," he said. "When tourists visit the same place each time, they can have different yet wonderful experiences." However, taking a closer look at the boost in the visitor numbers, the year-on-year growth was the first single-digit growth since 2011, raising speculation that travel to Japan among Koreans has past its prime. Considering the increase of the total outbound Korean tourists in 2018, Yamada said Japan put up a solid performance. "Last year's growth in the total number of Koreans who went overseas was also a single digit (8.3 percent). Of course, China and Vietnam saw robust growth, but there are many countries which posted lower numbers than us," he said. Instead, Yamada stressed that the portion of Koreans going to Japan out of the nation's total outbound travelers is more significant. "According to the data, one out of four Korean tourists visited Japan last year and it was the highest percentage ever," he said. In 2018, 28.7 million Koreans traveled abroad. "There is no other country to post such a high segment."